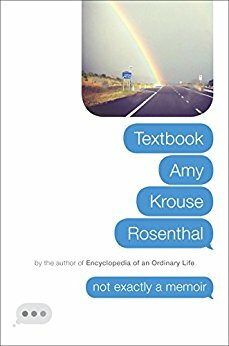 Her latest “grown-up” title, Textbook Amy Krouse Rosenthal, came out on August 9th, 2016. On September 6th, 2016, Amy was diagnosed with ovarian cancer. She passed away just last month on March 13th, 2017. I’d had this book on my to-read list for a while, and I wish I’d read it sooner. It is a follow up to her 2005 memoir, Encyclopedia Of An Ordinary Life; she comments that it was only appropriate to follow an encyclopedia with a textbook. It is a short, fast read, with lots of white space. The book was meant to be “interactive”; Amy offers a cell phone number readers can text, so that at certain points in the book you can send her notes and photos and maybe even win a freshly-baked pie. Texts sent while Amy was alive were kept and added to the book’s website. If you are already an “AKR” fan, tomorrow (April 29th) would have been her birthday. There is a Facebook group, #MoreForAKR, that you can check out if you’d like to pay tribute to Amy’s memory this weekend with acts of kindness.